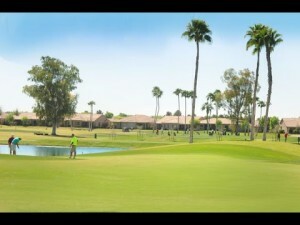 If you are looking for a golf course home for sale in Sun Lakes, AZ you will find them here. Sun Lakes, Arizona is a top choice for active adult communities in the East Valley and is comprised of five separate communities, each with their own golf course and other resort amenities. With 99 holes of golf in the Sun Lakes, Arizona active adult communities you will find plenty of variety and challenge in the game of golf. Sun Lakes Country Club, Cottonwood, Palo Verde and Ironwood each have an 18 hole golf course. Oakwood, the newest of the five communities, features 27 holes of golf. Cottonwood and Palo Verde are under managed by the same homeowner association so you can play both courses. Ironwood and Oakwood also share the same HOA. Sun Lakes Country Club, Cottonwood and Palo Verde are all private golf courses open to members and their guests. Ironwood and Oakwood are public, however, members receive benefits such as advance tee time registration. Homeowners in any Sun Lakes community are able to play the private courses by showing their homeowner card and paying the green fees. Memberships are available for year round golf as well as seasonal to accommodate the snowbirds. Approximately one third of the homes in Sun Lakes are golf course or waterfront lots. People choose a golf course lot for a variety of reasons. Obviously, some love golf and love to watch the golfers. Others enjoy the greenbelt and unrestricted views. Whatever the reason you will find some beautiful golf course homes for sale in Sun Lakes. Here are a few of the golf course homes for sale in Sun Lakes Arizona. Call The KOLB Team with ReMax Infinity at 480-440-0849 for more information. Sign up for new listing alerts and we will let you know as soon as a home that fits your criteria is actively for sale.